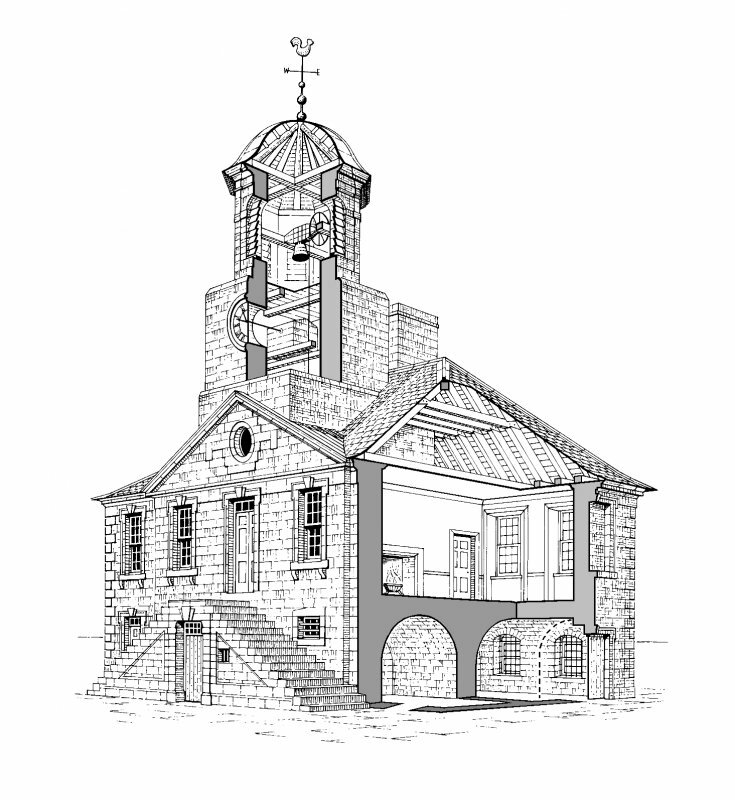 Front elevation Preparatory drawing for 'Tolbooths and Town-Houses', RCAHMS, 1996. 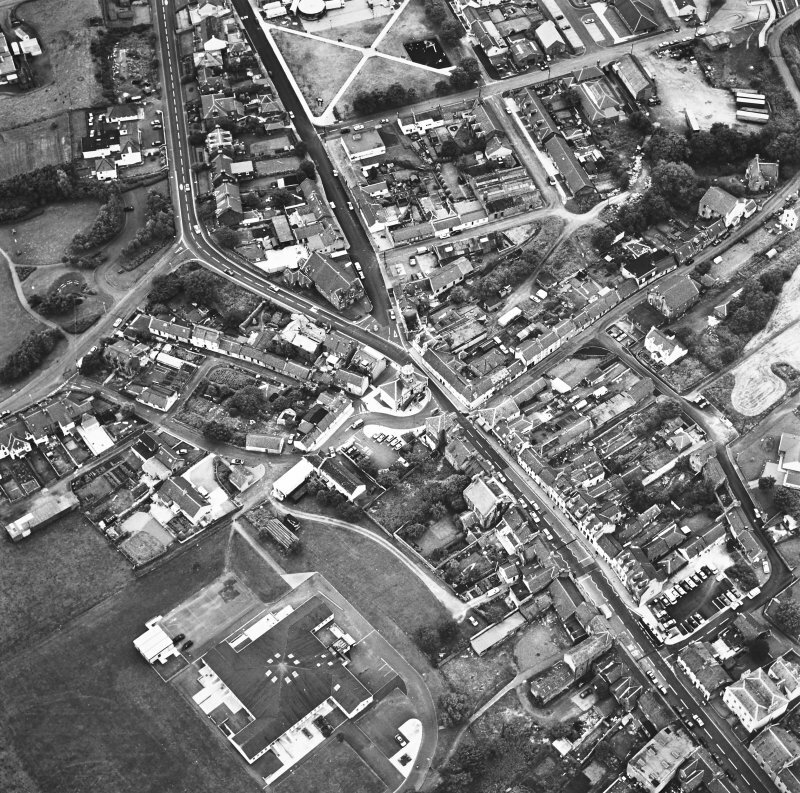 N.d.
View of Sanquhar Tolbooth from E.
View from WSW showing remains of forge with viaduct in background Sanquhar Town-house was built on the site of an earlier ruinous tolbooth. The 3rd Duke of Queensberry paid for the new building. The timber came from Leith, and the stone from the quarry at Cleughfoot and probably also from the ruins of Sanquhar Castle. The oculus in the pediment lights the first stage of the steeple. 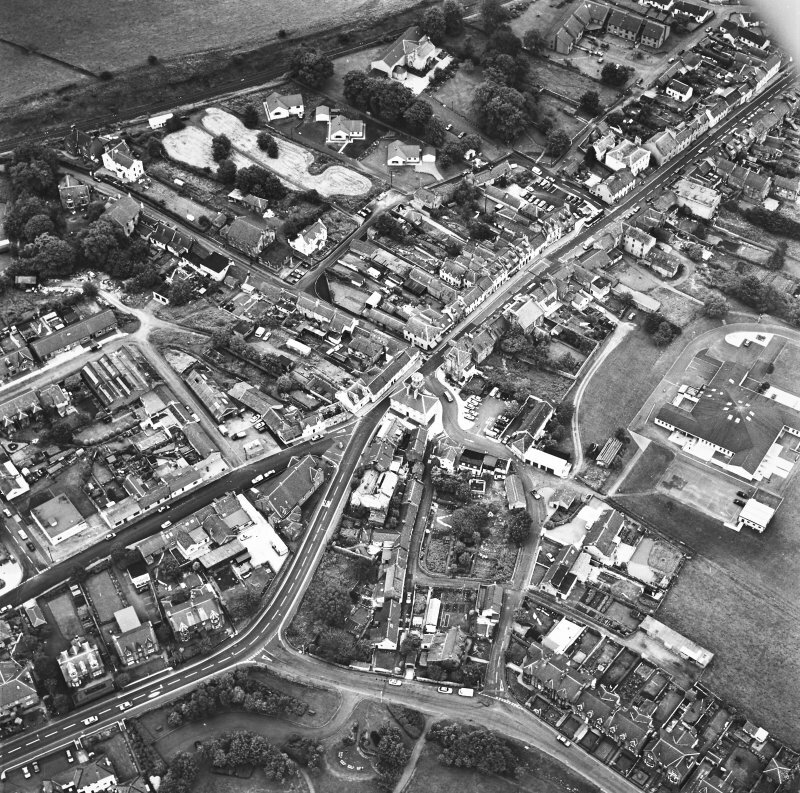 The date 1735 was added in the early 20th century. The bell of 1694 was recast in 1857, a new clock installed and the forestair and railing renewed. Perspective section from North East (not to scale) Preparatory drawing for 'Tolbooths and Town-Houses', RCAHMS, 1996. N.d. Floor plans Preparatory drawing for 'Tolbooths and Town-Houses', RCAHMS, 1996. 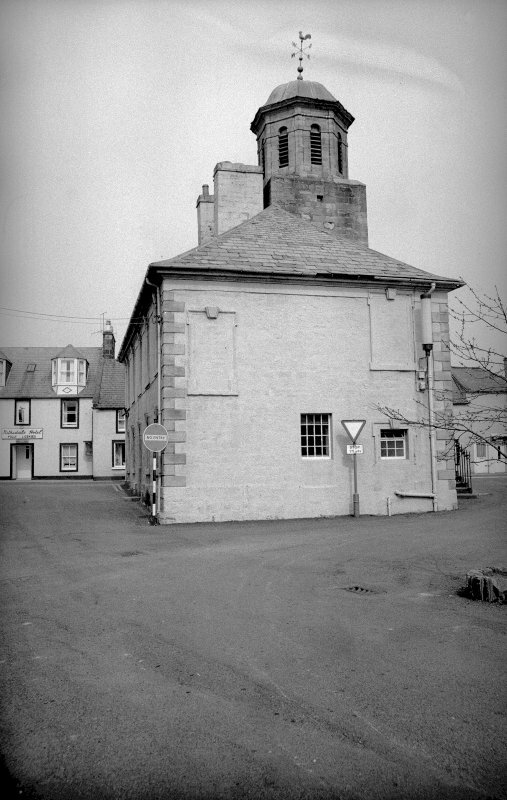 N.d.
(NS 7808 0990) Sanquhar Tolbooth was built in 1735 on the site of its predecessor. Stone from Sanquhar Castle (NS70NE 3) was used mainly in its construction. A set of jougs is affixed to the wall, by the side of the prison door. 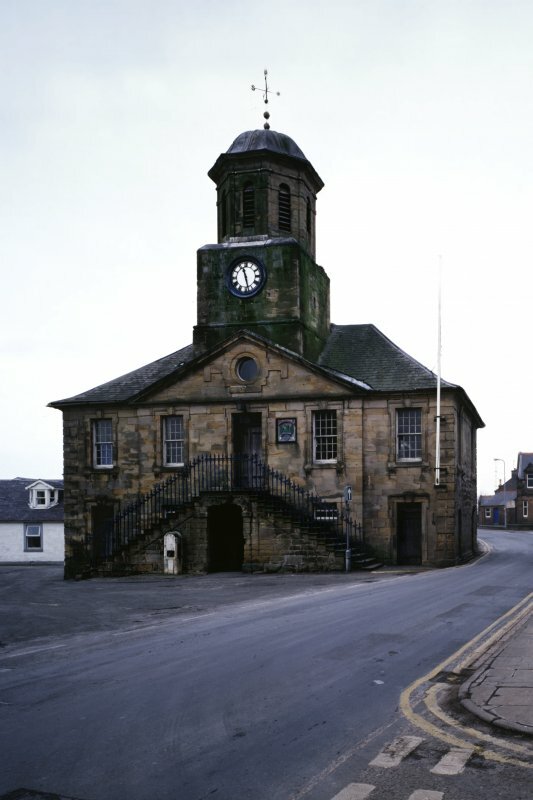 Sanquhar Tolbooth, a two-storey building in a good condition and now used as a museum. The jougs have now been removed and there is no obvious evidence of the building stone from Sanquhar Castle. Carriage of three double carts of Timber from Leith to Sanquhar for the use of the Town House of Sanquhar. 18 October 1735. Quarrying stone from quarry above Sanquhar. September & October 1735. Account to George Lorimer, mason at sanquhar a throwing down stones from the old castle of Sanquhar beginning 1736 - February 1737. 'Account His Grace the Duke of Queensberry to William Adam for timber furnished to the Town House of Sanquhar 1737 - cost ?119-9-2 3/4. Letter, Edinburgh June 20th 173( ). 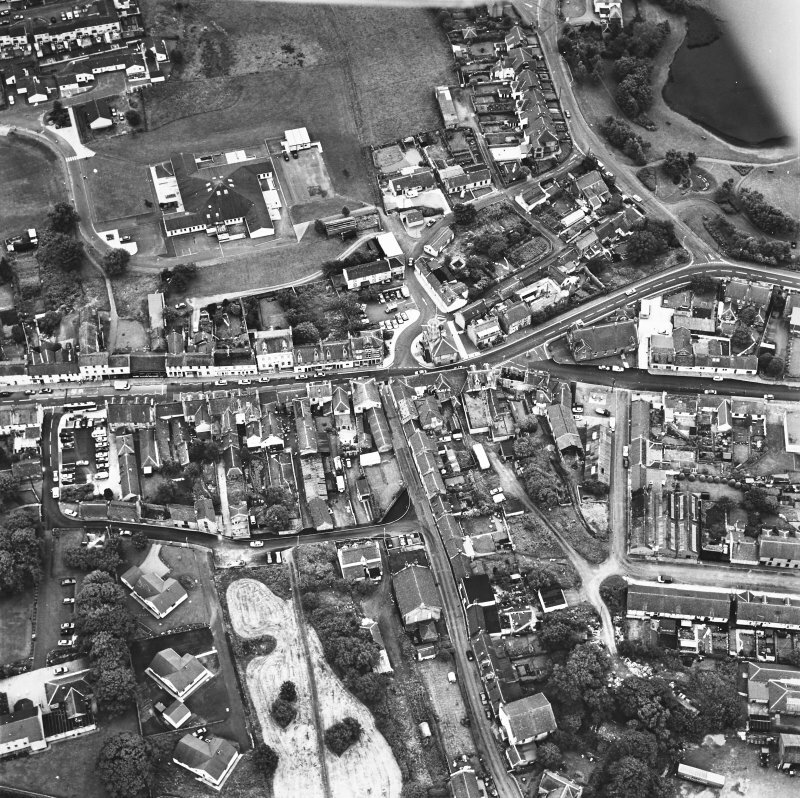 In regard Mr Adam has had a good deal of troubles since drawing the plan of the ( ) Town House, in sending advice and Directions to the Undertakers for carrying on the building. No money to pay Adam, suggests it should be got from Mr Goldie. 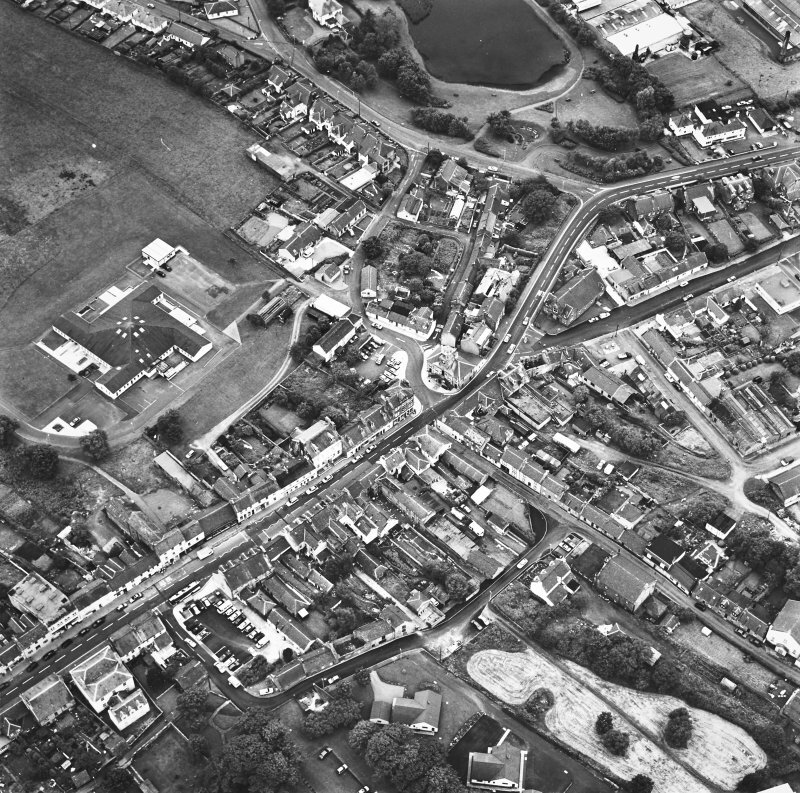 Photographic survey by the Scottish National Buildings Record/Ministry of Work in April 1957. Motorists on the A 76 are not in a position to appreciate the finer points of a building which partially restricts their passage through the centre of Sanquhar. But this building has the right of way over modem traffic; it has been here since 1735 and is one of the most handsome early Georgian tolbooths in the country. It was designed by William Adam, and built at the expense of the 3rd Duke of Queensberry (d. 1778). Materials for its building were partly provided by the ruins of Sanquhar Castle. It is a two-storeyed block with a square clock tower and octagonal cupola rising above the main five-bay and pedimented frontage. A double-sided forestair leads to a central fIrst-floor entrance. The building is not normally accessible, but the grander meetingrooms and offices were probably on the first floor, and there may have been ground-floor cells behind the forestair. The northern most first-floor room is known to have a large 16th century fireplace taken from the castle. 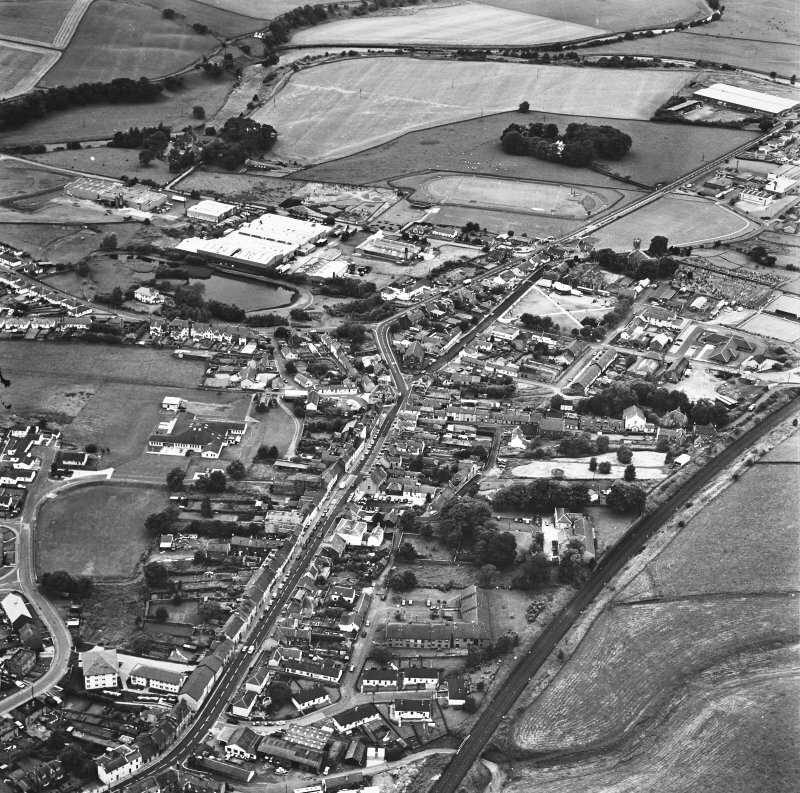 Although promoted to royal burgh status in 1598, Sanquhar's main period of growth did not come until the early 19th century with the expansion of its staple industry of coal mining, supplemented by the manufacture of worsteds. 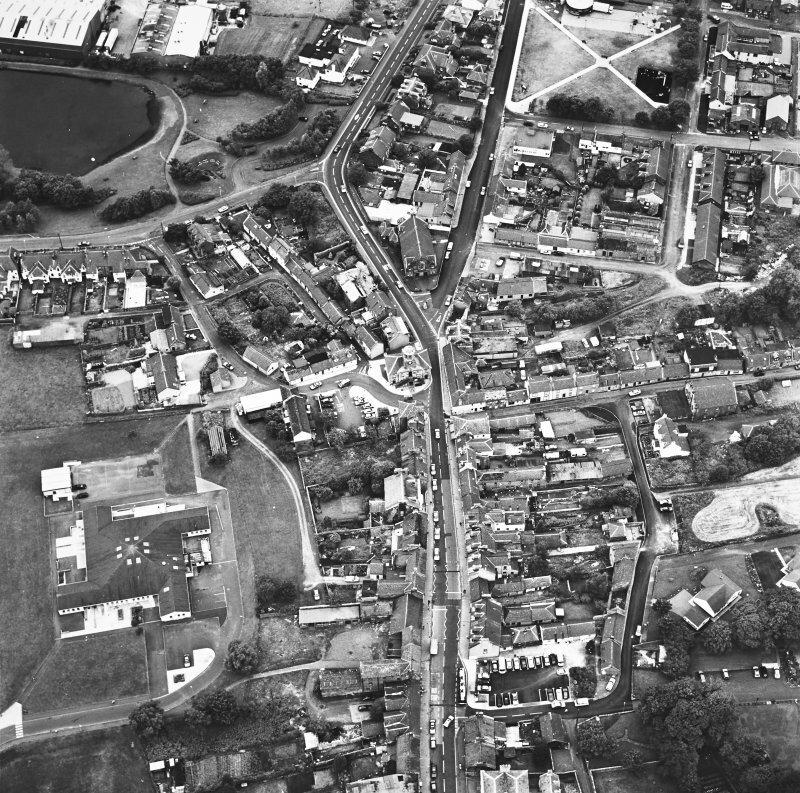 Sketchy knowledge of its early layout is gained from a document of 1508, and a census of 1684 showed that the number of adult inhabitants was then precisely 167. The top of the former mercat cross (1680) is built into St Ninian's Free Church, and some buildings in the High Street may be hiding 17th century origins. The little bow wind owed shop at 39- 41 High Street declares itself to be the oldest Post Office in Great Britain (1763). Designed by William Adam and built in 1735-9, the townhouse stands on an island site in the market-place to the S of High Street, 'fronting down the street toward the cross'. It is two-storeyed and rectangular on plan, measuring 15.8m from N-S by 11.1 m, and has a prominent hipped roof. Its main (E) front is of five bays, the central three forming a slightly advanced pedimented elevation above which there is a three-staged steeple. The principal rooms on the first floor are reached by a double forestair which encloses a ground-floor doorway. The E front and steeple are built of ashlar, and the other walls are of coursed rubble which has been painted over a thin layer of render. The angles are marked by stepped channelled quoins, and the openings throughout have freestone surrounds. In the front and rear walls they are disposed symmetrically, and all have lugged surrounds and projecting keystones, except for two small original windows behind the forestair and an inserted one in the S wall. The windows in the E and N walls have consoles supporting their sills. In the S end-wall an original window has been contracted in size, and another slapped through at the centre. The lowest stage of the steeple was lit by an oculus in the pediment, set in an irregular raised surround on which the date 1735 was incised early in the 20th century. The steeple has a square base terminating in a roll-mouldding below a plain clock-stage with a circular clock-face in its E front. Above this there is an octagonal belfry with narrow round-headed louvretl openings, surmounted by a heavy roll-moulding and a cornice which carries an ogival lead-covered cupola. The ground storey has a central corridor reached by a shouldered doorway enclosed by the forestair. In the end bays of the E front there are doorways, the N one giving access to a rectangular barrel-vaulted cell which has been divided by a later cross-wall. The S doorway 'enters a rectangular room in the S part of the ground floor, formerly used as a school-room, which has been partially divided by modern partitions. In the NW angle of the building there is a rectangular barrel-vaulted cell reached by a doorway from the central passage. The vaulted inner part of this passage was itself formerly a cell, while the square lobby below the steeple was used as an exercise-area. The E doorway appears to have been heightened by re-cutting, and two small vents flanking the doorway in the W wall of the passage have been blocked in recent years. 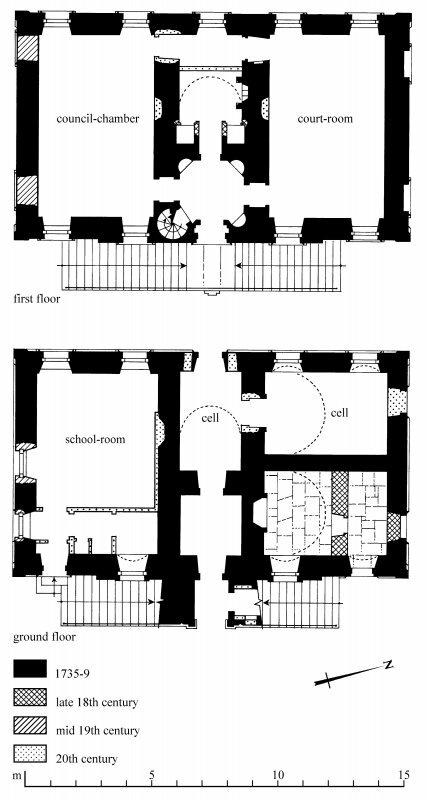 The first floor is regular on plan, containing two rectangular rooms to Nand S, and a central vestibule to the E with a barrel-vaulted chamber to the rear. The vestibule is roughly square on plan, but has half-round recesses with stone seats and scalloped heads in each angle, and doorways to N and S leading to the main rooms. The S room, which was the council-chamber, has two windows in the S wall at slightly different heights, both of them now blocked. The equivalent windows in the former court-room to the N appear always to have been blind. The central rear chamber has a fireplace with a plain surround in its N wall, and in the NE and SE angles there are document-cupboards, probably inserted in 1781 when it was being used as the town clerk's room. Recent alterations include the slapping through of a doorway to the NW angle of the S room, and the removal or blocking of fireplaces. The N room formerly had a large 16th-century fireplace which was presumably brought from Sanquhar Castle. Within the wall-thickness at the SE angle of the vestibule there is a spiral stair rising to the attic, which preserves much of the original collar-rafter roof-structure. Built into the outer wall N of the main doorway there is an armorial panel bearing a dragon's head spouting fire, the crest of the Crichton family, and inscribed: GOD SEND GRACE /1751. This was presumably associated with John Crichton, provost of Sanquhar from 1744 to 1765, but the panel was placed in its present position some time after 1957, and its original location is not known. At the N side of the N ground-floor doorway there is a vertical bar with a sliding ring to which the jougs were formerly attached. 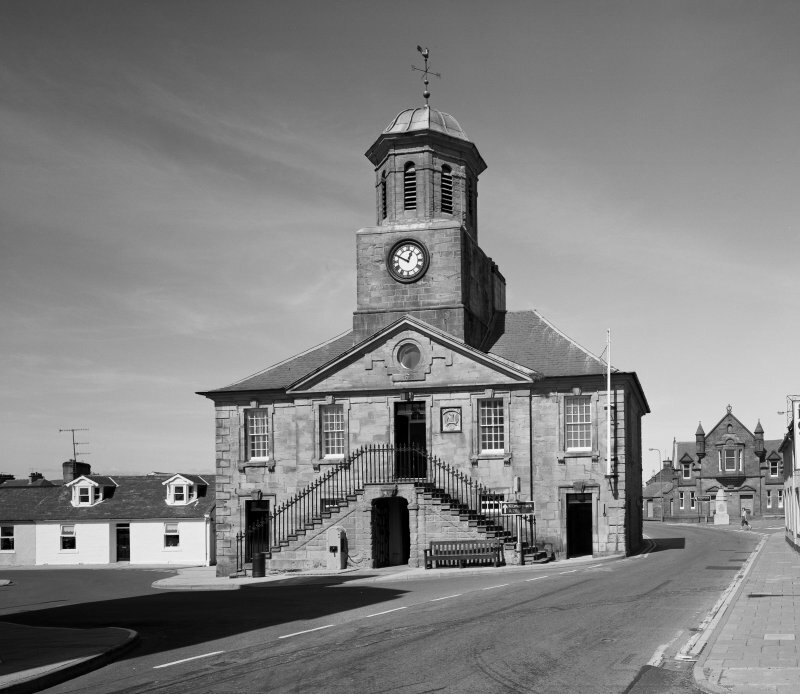 The present building replaced an earlier tolbooth on the same site, described as a two-storied building thatched with heather, which by 1731 was 'very insufficient and almost ruinous'. The new town-house was built at the expense of the 3rd Duke of Queensberry, and materials were procured in 1735 to 'shew the people that the Duke is in earnest to make that building'. Construction began in 1736 and was completed in 1739. As with many of his commissions, William Adam acted both as architect and supplier of materials, especially timber, which was brought from Leith. 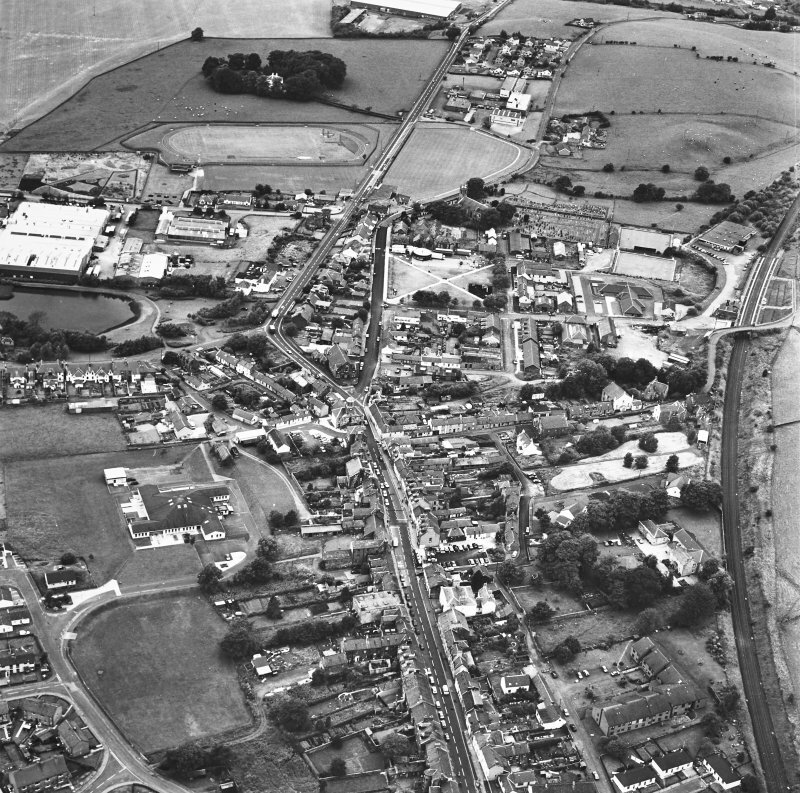 A letter of 1735 mentions' the Draft made by Mr Adams for the Town and School House of Sanquhar', and states that' Mr Adams is to order six cart loads (of timber) to be sent immediately'. 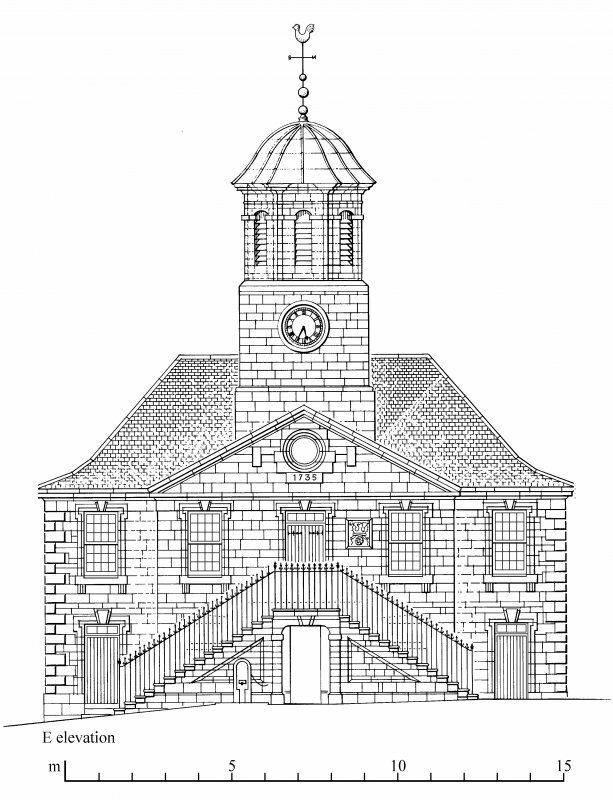 In 1738 he received immediate settlement of an account of £ 119 9s for timber supplied, ' because he has had a good deal of trouble since drawing the Plan of the within Tounhouse in sending advice & Direction to the Undertaker for carrying on the building'.The mason-contractors were George Laurie, deacon of the squaremen of Sanquhar, with Thomas Laurie and James McCall." Stone was obtained not only from a newly-opened quarry at Cleughfoot but also from the ruins of Sanquhar Castle, and material from the latter is said to have been employed in the construction of the vaulted rooms on the ground floor. Only minor alterations were undertaken before 1857, when the old bell of 1694 was recast and a new clock installed, and the forestair and railing were renewed. At about the same period a doorway was slapped through the S wall when the S room was used as a contractor's office for the building of the local railway. In 1987-9 the town-house was converted into a museum.